The way we all order our morning coffee is about to change – at least for those of us with a smartphone. Square, the company behind the iPhone- and iPad-based payment systems popular with independent coffee shops, just introduced a new app for iOS and Android called Square Order. It lets you pre-order a cup of Joe (or tall double shot caramel mocha latte) from your phone before you arrive, without the need to wait when in the store. Square Order is more than just an ordinary order-by-phone app, however. It uses geolocation to know when you’ve almost arrived at the café, so your order can be perfectly timed to be ready – and piping hot – on your arrival. You’ll get a notification when your order is being started. And there’s no need to stand in line once you walk through the door. That’s a huge plus considering how crowded coffee shops can get during the morning commute. Change is coming soon for fans of the coffee chain Starbucks, too. The company is currently testing a new mobile payment app feature that also allows you to place and pay for an order ahead of time, skipping the line. “It’s something our customers have asked for,” Starbucks Chief Digital Officer Adam Brotman told Bloomberg earlier this year. 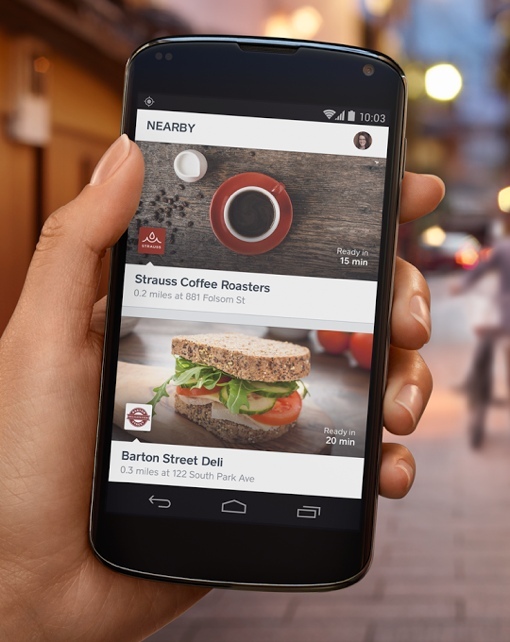 It’s unknown whether the Starbucks app will also contain a geolocation feature. Square Order is currently being tested in San Francisco and in New York City, though one can only imagine this functionality will soon be open to any coffee shop, café or restaurant willing to support it. Starbuck’s advance order feature will be launched “in an undisclosed market” before going nationwide. No dates for either have been announced. You can learn more about the Square Order app by visiting the Square website. It's currently available for free download on Apple iOS devices via the Apple App Store and for Android devices via Google Play. The free Starbucks app is also available for iOS on the Apple App Store and for Android on Google Play.